NIA CHARLESTOWN (JULY 20, 2016) — Laurencia Walters and Nicoyann Blackett are the recipients of the Medical University of the Americas (MUA)/ Nevis Island Administration (NIA) scholarship for the 2016/2017 cycle. The announcement was made by the Chairperson of the MUA/NIA Scholarship Committee and Permanent Secretary in the Ministry of Health in the NIA Nicole Slack-Liburd, at a brief ceremony at the Alexandra Hospital conference room on July 19, 2016. “We are extremely excited to announce our winners of the scholarship. Ms. Laurencia Walters and Ms. Nicoyann Blackett will soon begin their tertiary education in the areas of health and science. “Ms. Walters will be pursuing radiological sciences at Midwestern State University in the United states of America, which is a critical need here at the hospital. Ms. Blackett will be pursuing studies in the area of biology at the University of the West Indies in Jamaica and will move on to study animal science,” she said. Slack-Liburd also congratulated the recipients, wished them success in their endeavours and encouraged them to return home at the end of their studies to contribute to the development of the health sector on the island. The NIA/MUA Health Science Scholarships are offered in an effort to encourage the pursuit of tertiary education in Medicine, Health and the Sciences. Two scholarships are offered on an annual basis to deserving high school graduates with a sound academic record. They afford the awardees the opportunity to study for up to four years at the Medical University of the Americas, the University of the West Indies or at any four-year United States based institution. Meantime, Deputy Premier of Nevis and Minister of Health Hon. 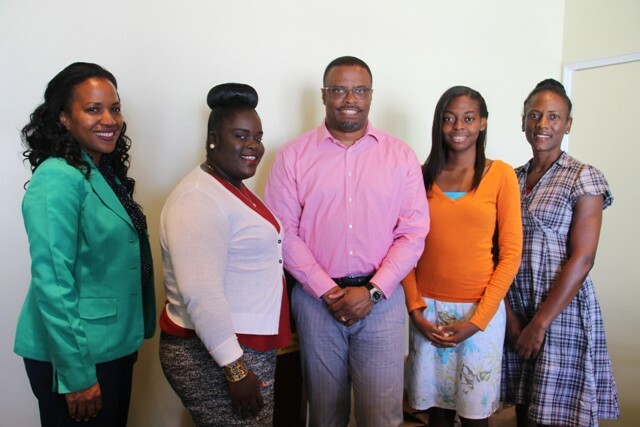 Mark Brantley, expressed his commitment to ensuring that residents on Nevis are offered scholarship opportunities and the youth are empowered to pursue tertiary education. The Health Minister encouraged the recipients to make use of the investmens being made in them. “I feel that you ought to cherish the opportunity that you’ve gotten and that you go out there and you make yourselves, your families and your island proud. “You come back here in a few years and demonstrate that the investment has paid dividends for you in your personal life, the lives of your family and also for the wider community,” he said. In response, both recipients thanked the MUA/NIA for the scholarship and outlined their reasons for choosing their field. Blackett stated that she chose animal science because of her love for animals. Walters explained that she chose radiological science because of the direct need for specialists in that field on Nevis. Also present at the ceremony was Shelisa Martin-Clarke, Health Planner at the Ministry of Health and a member of the MUA/NIA scholarship committee.